The Tamar HUG – Helping | Understanding | Giving. To strengthening families of cancer patients in their daily coping with cancer and its effects. The organization trains volunteers and community teams to create a supportive and empowering environment that will help the patient and his family focus on recovery. The diamond shape best describes the model of the enveloping of the patient by his family and also of the volunteer. At this stage, the Yad Tamar Team is involved – professionals giving advice, organizations which can help out…and more. The interior area of the diamond describes the work of the volunteers directly with the patient and his family. 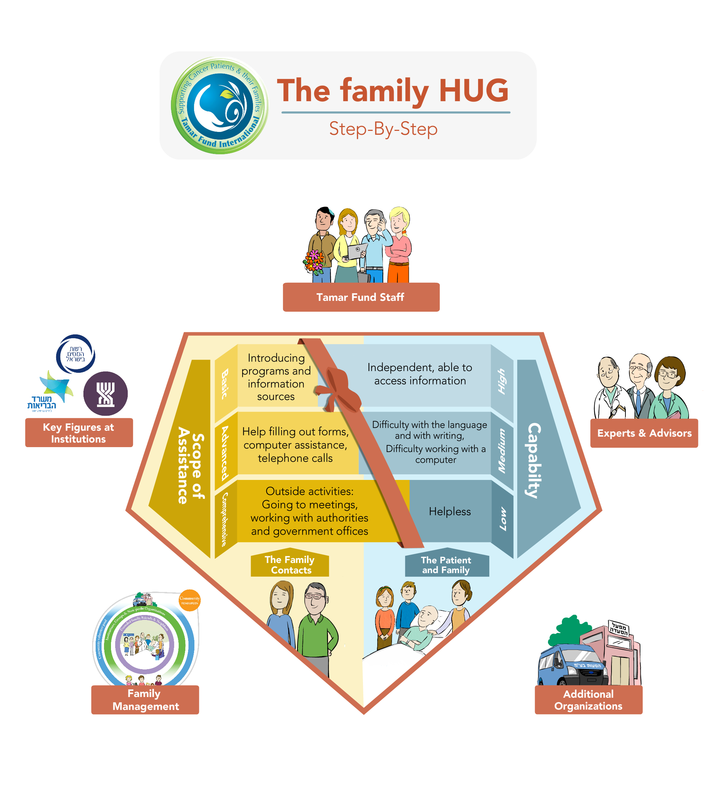 The model demonstrates the structured combination of the coping abilities of the patient and his family, together with the amount of on-hand assistance given by the volunteer. The higher theability of the patient to cope – the assistance offered is more focused and more short-term. In each community, there is a clear need to connect between the needs and abilities of the family at hand with the help available from the community. Most of the communities are looking for an easy and effective way to manage crisis within their communities in a way that will also strengthen the community. The ability to provide a longitudinal vision and plan of aid for the family, where the support continues after the initial crisis has passed. Since 2009, Yad Tamar has been working to create a profound social and community change that provides healing powers to cancer patients and their families by strengthening their immediate environment. Yad Tamar, founded on dedicated volunteer teams, and committed to community social responsibility, as stated in the Book of Zechariah (7: 9): “And mercy and mercy, do his brother.” As part of this commitment, Yad Tamar continues to train individuals and communities throughout the country to provide a wide and systematic response to a large number of people in an efficient and structured manner, easy and pleasant for supporters and dependents. Yad Tamar leads a social-community-conscious change in support, information and safety nets for cancer patients, their relatives and the surrounding community. Yad Tamar expands the circles of help and assistance, connects the various organizations involved in the field of cancer, and promotes cooperation. Yad Tamar is based on a carefully selected network of volunteers, accompanied by professional, personal and sensitive support, with the needs, wishes and abilities of the patient and his relatives in mind. Yad Tamar uses state-of-the-art technologies to respond with great sensitivity, empathy, speed and professionalism. Yad Tamar is involved, inter alia, in the development and implementation of innovative, practical methods of assistance that are adapted to the medical, social and technological changes. Yad Tamar HUG – Be in touch! Helps the family in daily operations and proper organization in times of crisis. Helps communities around the patient to organize effectively over time.